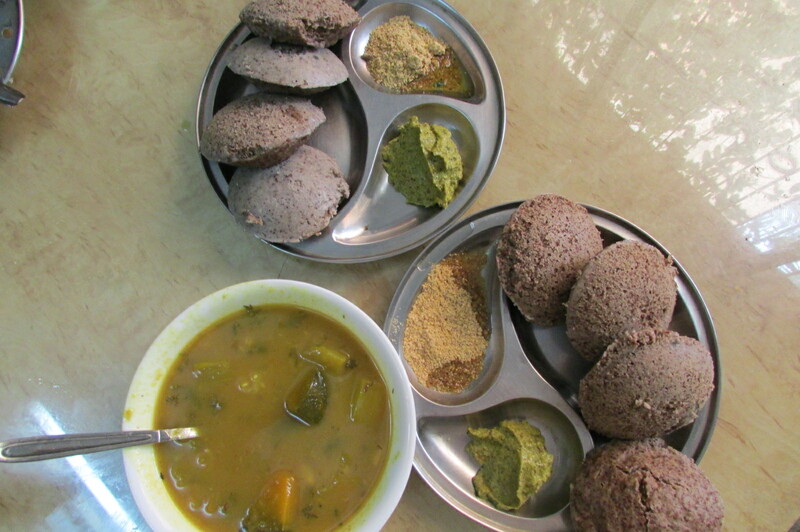 Tri-Millet Idli – made of Ragi, Sama and Proso millet along with Urad (Black Gram). In Ragi Idli and Dosa, Take 1, I tried using whole ragi (finger millet) to make the batter used for idli and dosa. Since I’d never done nor seen any one do it before, I used part ragi and part rice along with the urad (black gram). Pleased with the results, I tried using only ragi and urad in my next attempt, Ragi Idli and Dosa Take 2. To my pleasant surprise, this batter also rose well and produced tasty idlis, albeit heavier than even my usual idlis which, being always whole grain, tend to be denser than white idlis, just as whole wheat bread is less airy than white bread. Now that I have made idlis and dosas using just about every kind of millet I have been able to get my hands on – little millet (sama), kodo millet (arikalu), proso (varigalu), pearl millet (bajra) and finger (ragi), I thought, why not mix them up? Rather than complementing ragi with rice (remember when we only used to make idlis with rice??) I could use any other millet in combination. So this time I put together little millet, proso millet and ragi (finger millet) along with urad (black gram) to make the idlis. What you want to do is use 1 part ragi, 1 part other millet(s) and 1 cup urad or urad dal (black gram – whole or split). Step 1: Wash and soak the grains and beans. Pictured here, clockwise from top left are sama+proso, whole urad, and ragi. After the grains and beans soak for 8 hours and start to ferment, small bubbles will form at the top. Step 1: Wash and soak the grains and beans. I soaked the sama (little millet) and variga (proso millet) in the same pot, 1/2 cup each. In another pot I soaked 1 cup ragi and in the third, 1 cup whole urad (black gram). This maintains an overall ratio of 1 cup beans to 2 cup grains. You may also use urad dal (split black gram) but make sure it is black, i.e. with peel intact, to get the goodness of the whole bean. After the grains and beans soak for 8 hours and start to ferment you will see small bubbles form at the top. I wash the grains thoroughly before soaking so that I can use the soaking water, which contains some of the nutrients from the grains as well as good bacteria that improves mineral absorption in the gut. Step 2: Grind the grains and beans. You can use a blender, a mixie, a stone grinder or a motorized stone grinder like the one pictured below. Here are some lovely shots of the three colors blending. The black peel on the urad loosens after soaking and assumes deep shades of olive green. Ragi, Sama, Proso Millet and urad under the stones of the grinder. Shades of red, brown, black and beige blend under the stones of the grinder. The grains and beans blend into a smooth batter, ready to use in idlis, dosas or waffles. Leave the batter to rise for 8 hours or overnight. Because salt can interfere with the action of the yeast which the urad dal (black gram) needs to attract from the air, some say you should add the salt after the batter rises. I have tried both ways and not noticed any difference. But in a climate in which I was uncertain of the ambient yeast, I might add the salt afterwards just to improve the conditions for the batter to rise. If you add the salt before leaving it to rise, it will blend right in. If you add the salt after it rises you have to blend it in – either with a spoon or, if you want the lazy method – leave the batter to rise in the vessel of the wet grinder itself, so that all you need to do is turn it on for two more seconds after adding the salt. The dough has risen! The surface has darkened due to exposure to oxygen, indicating the iron-rich contents of the batter. If we spoon out some of the batter, we can see the color difference above and below the surface. After the batter rises, it is ready to use in idlis, dosas or waffles. When you need a couple dozen, as we typically do, idlis are the easiest to make. Pour the batter into lightly oiled idli plates and steam on medium-high heat for 20 minutes. Pour the batter into idli plates and steam for 20 minutes. Allow to cool for 20 minutes before removing. a special idli steamer that has a whistle on the lid to let you know when it has reached medium-high heat (and to remind you that it is still on the stove!). Pour 2 cups of water in the pan and then insert the stack of idli plates. If water touches the lowest idli plate then put an ordinary metal plate on the bottom in order to slightly elevate your idli stand. Turn the stove on medium high. Once you see steam coming vigorously out of the top, let it cook for 20 minutes. Turn it off and let it cool for 20 minutes before removing from the pans (though in a pinch you could have them sooner). Serve with your favourite dip – such as chutney, podi (powder), or sambar. Yield: 32 idlis. Serves 8-10 people. Just for fun – here is a video of the batter in the grinder. SO much fun to watch! Next Teff Idli and Dosa! Yes, I have made idli with bajra (and kodo) and it came out very well. I did not check how long it took to rise since I let all the batters rise overnight. Maybe I will try jowar idli next, thanks for the suggestion!